As a breathtaking romantic period-drama set during the Joseon dynasty, The King and the Clown is, perhaps unsurprisingly, one of the highest grossing films in Korean cinema history. However what may be surprising for some is that the romance is homosexual in nature, particularly in a culture where such relationships remain largely taboo. Yet despite such prejudice the film has not only garnered incredible critical praise and commercial success, but has also acted as something of a catalyst for a shift in ignorance largely thanks to androgynous actor Lee Joon-ki. Two talented male minstrels – ruggedly masculine Jang-saeng (Kam Woo-seong (감우성) and delicately feminine Gong-gil (Lee Joon-ki (이준기) – are the leads in an acting troupe that perform for nobility in Joseon dynasty-era Korea. After the performances, Gong-gil is often forced into sexual slavery by their corrupt manager for extra money, sickening his partner. Unable to continue the de-humanising practice, the pair escape and depart for Seoul to earn their fortunes as performance artists and comedians in the capital city. Upon hearing of the cruel absurdities of the current ruler King Yeon-san (Jeong Jin-yeong (정진영), the duo join forces with other street performers to enact a comical tale ridiculing the King with the truths that others are too scared to tell. Their popularity is such that government officials take note, punishing them violently. 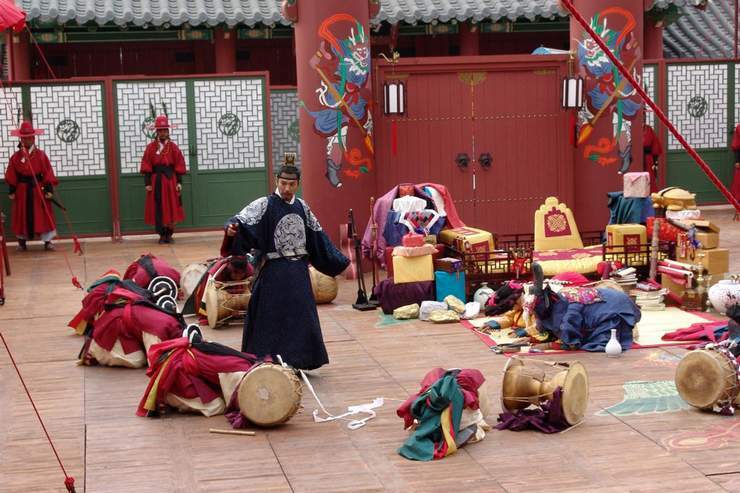 However they are spared upon one condition – they must perform their mocking routine in front of the King himself, and, should he laugh, Jang-saeng and Gong-gil will be freed. The King and the Clown – or more literally translated as ‘The King’s Man’ – is an incredibly poignant and captivating film and a wonderfully colourful historical tale. This is largely due to the partnership between the highly charismatic lead protagonists who never cease to be compelling, and an extremely well-balanced script by Choi Seok-hwan (최석환) who artfully plays with pacing to provide sensitive and thought provoking scenes throughout. Characterization is central to the success of the film, providing fully-rounded roles to individuals who could easily be stereotyped by continually emphasizing their emotional complexity. Jang-saeng is a gifted athlete and performer, with an over-powering compulsion to be truthful and to upset those in power through disrespect; Gong-gil is an equally talented artist who is as adept at acting as he is beautiful, aware that both features are a blessing and a curse; even King Yeon-san, who is often described in the annals of history as the most brutal and selfish ruler in the Joseon era, is portrayed as a psychologically damaged man through childhood torment and the pressures of court. In each case, the narrative allows the protagonists the time to convey their motivations – conscious or otherwise – while the actors that portray them fully inhabit their roles and are utterly convincing whenever they appear on screen. The concept of truth-through-performance is masterfully conveyed, recalling the likes of Shakespeare’s Hamlet of the ‘play within a play’. As such the film operates as an insightful commentary of the era, depicting the obscurity of truth that is seemingly inherent with power as well as the corruption and tyranny of those in court, through traditional cultural forms. Due to this The King and the Clown expresses a grand, ‘epic’ quality, one which is unfortunately not capitalized on by director Lee Joon-ik. The director is highly competent throughout the film, featuring some wonderful set-pieces and intimate sequences, yet he falters in conveying the grandiose scale of Joseon and the palace in particular, with an establishing shot of Seoul the only notable exception. Despite such shortcomings director Lee Joon-ik is incredibly skilled at conveying intimacy and poignancy as he visualizes the cultural flair and exhibitions with passion and verve, in conjunction with the violence and intense distress that consistently follows. The director’s representation of the homosexual relationships within the film are cautious and understated yet rather than a criticism this actually infers a more innocent and a sweet natured love, although some factions of the audience may take issue with King Yeon-san’s dalliance with Gong-gil as the product of an unresolved Oedipal complex. As comic performers Jang-saeng and Gong-gil, Kam Woo-seong and Lee Joon-ki are absolutely enthralling. Kam Woo-seong masterfully conveys the arrogance and audacity of the character, with his unbridled distain for those of a higher societal position palpable. The actor is wonderfully charismatic yet simultaneously tragic, traits that he exemplifies through every mannerism and facial expression with sincerity. Such a description also befits Lee Joon-ki who, as the androgynously beautiful Gong-gil, is a delight. He conveys femininity and elegance with startling conviction, with his resignation to fulfill his sexual role following the performances tender and heartbreaking. His character is as much a commentary about the manipulation of women as it is about homosexuals by those in power, and Lee Joon-ki does not disappoint in emphasizing the sheer injustice of societal inequality. As the film’s other central protagonist, Jeong Jin-yeong is also frighteningly mesmerizing as King Yeon-san. The actor eloquently conveys the sadistically tragic nature of the ruler as he unpredictably switches emotions on a whim, portraying the leader as an underdeveloped adolescent in one breathe whilst in the next a violent and cruel man. As such Jeong Jin-yeong is fascinating to watch as the long hidden truths are revealed, for his reactions are unpredictably horrifying. The King and the Clown is an amazing tale and a wonderful journey through one of the darkest eras of the Joseon dynasty. The narrative and characterization are excellent, as is the acting by all the principal cast who never cease to be enthralling and compelling. While the directing is somewhat lacking in scale the emphasis on intimacy and poignancy makes the film and enduring classic and a testament to the creative qualities of Korean filmmakers. Not worried about spoilers, but when I plan to review a film, I prefer to do so without having read other reviews beforehand. I understand, I’m similarly minded. Looking forward to reading your thoughts!